Fancy access to Emirates’ business class lounges the world over, along with Qantas’ international business class lounges and Australian domestic Qantas Clubs for an entire year, just by taking one return flight to Dubai, London or anywhere else in Europe? That’s exactly what Emirates is offering right now via its Skywards frequent flyer program, which is currently running a handy ‘double tier miles’ promotion – tier miles being the Skywards equivalent of status credits – allowing you to blast from zero to hero status in no time at all. Just one return business class trip on eligible Emirates fares from Australia to Europe can be enough to unlock Skywards Gold status, even if you’re starting from scratch as an entry-level Skywards Blue member, or haven’t even enrolled. 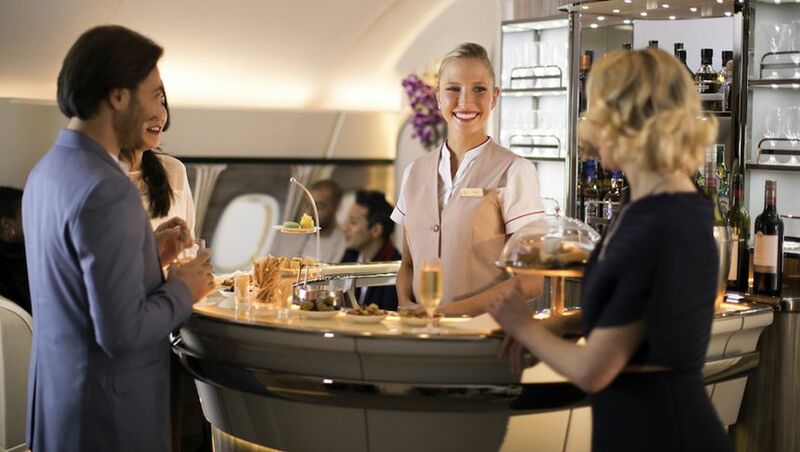 Better yet, make that two return business class flights and you’ll reach Skywards Platinum: opening the doors to Emirates’ first class lounges in Dubai, Qantas’ first class lounges in Sydney and Melbourne, and Qantas’ domestic business class lounges in Australia for an entire year. Skywards Platinum members can also nominate one other person for a complimentary Skywards Gold membership, making this promotion even more generous if you can get to the top of the latter. Here’s what you need to know to catapult yourself – and perhaps also a friend or partner – to a new shiny status tier. Before booking or taking any flights, you’ll first need to register for this ‘double tier miles’ promotion – easily done via the Emirates website, where you can also join Skywards if you’re not already a member. Whether you’re an existing or new Skywards member, you’ll need to complete that registration by 11:59pm Dubai time on Monday December 3, 2018: that’s 6:59am Sydney time on Tuesday December 4. You’ll then need to make a new Emirates flight booking between November 26 2018 and that same cut-off time on December 3, for travel between November 26 2018 and 11:59pm (Dubai time) March 31 2019. If you meet the conditions above, you’ll be able to earn double Skywards tier miles on Flex and Flex Plus fares in first class, business class and economy, although double tier miles cannot be earned on other fare types. Any codeshare flights, including Emirates-operated flights booked under a QF flight number. All other tickets that don’t normally accrue tier miles, such as frequent flyer reward bookings. Double tier miles can be earned on both one-way and return bookings, including multi-city fares where you arrive into one city and depart from another, as people often do when travelling to Europe. Emirates offers four public membership tiers in its Skywards frequent flyer scheme, including Blue, the entry-level. Emirates Skywards Silver: Yours after earning 25,000 tier miles in a year, offering unlimited access to Emirates’ business class lounges in Dubai prior to Emirates flights, plus priority check-in, boarding, and 12kg of extra baggage on most Emirates flights, among other perks. Emirates Skywards Gold: Achieved with 50,000 tier miles in a year, with lounge privileges across Emirates’ worldwide network (not just in Dubai as with Silver), joined by access to domestic Qantas Clubs in Australia and Qantas-operated international business class lounges (except in or on journeys to The Americas and South Africa), with 16kg of extra checked baggage with Emirates, and more. Emirates Skywards Platinum: Enjoy access to Emirates’ first class lounges in Dubai after earning 150,000 tier miles in one year, along with access to first class check-in, 20kg of extra baggage on most Emirates flights, access to the Qantas First Lounges in Sydney and Melbourne (when flying Qantas or Emirates, except to The Americas and South Africa), and Qantas domestic business class lounges in Australia when flying Qantas. Additionally, Emirates Skywards Platinum members can gift a complimentary Skywards Gold membership to a spouse, partner or friend, so reach Skywards Platinum status and somebody of your choosing will jump to Gold as well, even if they’ve never flown with Emirates before! Here are just some of the ways you could qualify for each Skywards tier under this ‘double tier miles’ deal, assuming you don’t currently have any tier miles at all. Take one return Emirates business class trip from Sydney to Bangkok or from Melbourne or Brisbane to Singapore, booked on a business class Flex fare (earning 18,200 base tier miles, doubling to 36,400) or a business class Flex Plus fare (19,760 base tier miles, doubling to 39,520). Take two return trips on the same routes in economy Flex (15,600 base tier miles, doubling to 31,200 tier miles) or economy Flex Plus (20,800 base tier miles, doubling to 41,600 tier miles). Fly with Emirates in first class on two return trips from Sydney to Christchurch, earning 13,000 base tier miles on both Flex and Flex Plus fares, doubling to 26,000 tier miles. Jet to Bangkok (from Sydney) or to Singapore (from Melbourne or Brisbane) on a single return first class trip, earning 26,000 base tier miles on both Flex and Flex Plus fares, doubling to 52,000 tier miles – that’s Skywards Gold in just two flights. On the same routes, take two return business class trips on Flex or Flex Plus fares, providing a grand total of 72,800 and 79,040 tier miles, respectively. Take two return trips in business class or first class from Sydney, Melbourne, Brisbane or Adelaide to London or broader Europe, on Flex or Flex Plus fares. Perth residents could also achieve the same with two return first class trips to Europe (Flex or Flex Plus), but if flying business class, would need to take three return trips instead, as flights between Perth and Dubai earn fewer tier miles than other Australian cities, given the shorter flying distance. Fly return from Sydney to Bangkok or from Melbourne or Brisbane to Singapore three times in first class (Flex or Flex Plus), or four times in business class (Flex Plus). The same could also be done on business class Flex fares, but would require five return trips. Don’t forget, if you’ve already earned Emirates tier miles this membership year on previous flights, you’ll be closer to gaining or retaining Silver, Gold or Platinum status, so may be able to get there after fewer trips than indicated above, being what you’d need if building Skywards status from scratch. To register for the ‘double tier miles’ deal or for more information, head to the Emirates website. You can also check how many tier miles you can earn on any given flight using Emirates' earning calculator, remembering that double tier miles are only offered on Flex and Flex Plus fares, so you'll need to manually double these figures to see what you'd fetch under this promotion. Sounds great.we use thai and get no reward? So small points no use! yeah those calcs didnt work out. booked a return first class perth to dusseldorf expecting double 23500 points each leg - 23500 x 2 = 47000 each way - 94000 for the return and im bumped to platinum. spoke to emirates and they said this i worked out on "base miles" where there is no reference on the website or used when using their points calculator. i did my calcs just like it said in this article, unfortunately doesnt work! Comment on "Fast-track to Emirates Skywards Gold in a single return trip"